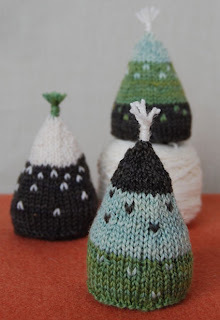 These are among some of my favorite "finds" for the week...holiday craftiness. 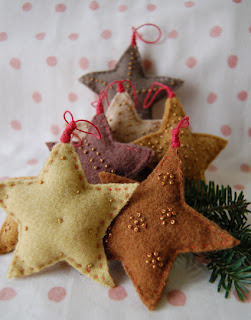 Tutorials for making the felted stars can be found here. This wreath was found via Artsy Mama's blog (visit her, she's having a 500th post giveaway). Artsy Mama has a very ....hmmm...well...artsy blog. Lots of great ideas and inspiration. 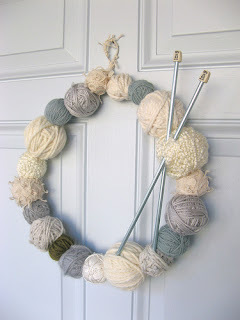 The yarn wreath was actually posted here, on Dottie Angel's blog. These little air fresheners...how cute! They could easily turn into ornaments. Instructions can be found here. For the "Ultimate Handmade Holidays Master Craft List", visit Sew, Mama, Sew. In November, she hosted a month-long homemade crafts tutorial project. There are instructions for making a multitude of gifts. A great site to keep in mind for next year's gifting. I just adore that yarn wreath! That is the cutest thing ever! Gosh, who doesn't have enough little balls of yarn...the color choices are endless...hmmmm, thanks for the idea! Love these projects! The wreathe is sew creative! That yarn wreath is just the best. So simple, but so unexpected. Thanks for the visit Teresa. :) I just love the yarn wreath, it is so unique! That wreath with the balls of yarn is so clever! Very cute. I'll have to check out her blog - so many blogs so little time LOL!